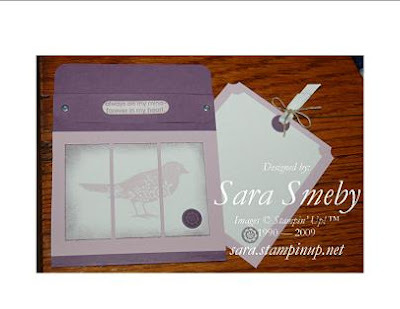 I've combined two of my favorite things in this card: pocket cards and the Always stamp set. I like both because they're very versatile. I've used the pocket card for a birthday invitation and thank you note (I've still got one thank you note on my desk; maybe I'll post it, too), as well as for note cards like this or occasion cards (birthday, anniversary). k love what you did with the bird... TFS! So very elegant!!! Thanks for the inspiration. The colours are pretty!